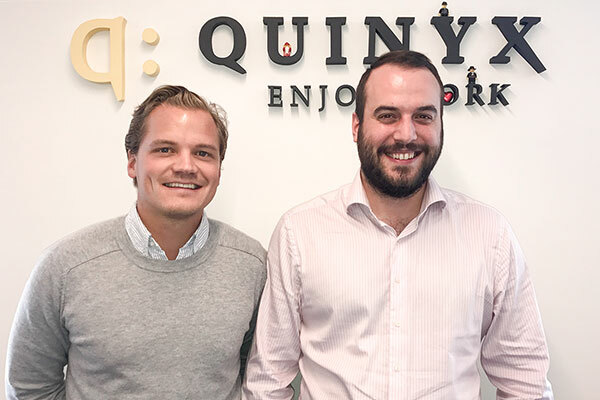 As Quinyx continues to grow, we welcome on board Erik and Lukas, the new additions to the UK team! Erik comes from Stockholm, Sweden. He has been with Mercuri Urval (leading HR Consultancy working with over 3,000 clients) for over 5 years as an International Business Consultant, and has an MSc from Uppsala University in Business and Economics. Lukas comes from the Czech Republic. He has been with SAP for over 3 years as a New Business Executive, and has a degree in Hotel and Restaurant Management from the Hospitality and Tourism College. What is your role and what does it mean exactly? Erik: My role is Business Development Manager (BDM), I will be key point of contact for my clients, helping them in their decision and setting them up for success in their future workforce management strategies. Lukas: My role is Business Development Representative (BDR), which is basically the very beginning of the sales cycle, creating the pipeline, prospecting and, hopefully, helping to turn leads into clients. Erik: Coming from Sweden, Quinyx has a great reputation both in terms of product and company culture. When I deciding to move to the U.K. it was a given for me that I would get in touch with Quinyx and thus far I’m not disappointed! Lukas: Quinyx feels like a very fresh and dynamic company. I like the background of how the company started, with Eriks story, having worked in McDonalds and identifying a real problem that employees were facing everyday. Also, everyone I met in the interview process was really nice and that won me over as well. I also believe in the product! Erik: Great team in the U.K. Young, dedicated and sharp. I already had the chance to meet with clients and had interesting discussions regarding their challenges. Excited to get my own hands dirty. Lukas: Very good! Definitely hands-on and very friendly and relaxed atmosphere, but also hard working. I do like the freedom of your own role, and you can use your own initiative and ideas to move forward. How do you see your future at Quinyx? Erik: First step is to hone the product, become fluent in the language of Quinyx and to become a trusted partner for my clients - then sky’s the limit. Lukas: I would like to progress further as a sales executive, and be involved more in the different stages of the sales cycle. What did you do over the summer before joining Quinyx? Erik: I actually took some time off and made sure I spent time travelling and meeting friends and family. I worked as a bartender 10 years ago and got to visit my old pub in Nice and got a little nostalgic. Lukas: I visited family in Bulgaria with our new-born - it was the first time our son met his grandparents! We plan on taking him to my parents in the Czech Republic beginning of next month. Before you know it, it’ll be Christmas, any plans? Lukas: It’ll be our first christmas with our son, and we will spend it in the UK altogether. Also, looking forward to the Quinyx Christmas party! Thank you very much, Erik and Lukas. We wish you best of luck for your journey with Quinyx!